Foot Levelers produces custom-made SPS (Spinal Pelvic Stabilizer) Orthotics individualized to stabilize your spine and pelvis by correcting imbalances in your feet – the foundation of your skeletal system. These imbalances contribute to fatigue, misalignments, and pain in areas throughout your body; they may even occur if you’re not experiencing foot pain. Off-the-rack shoe inserts cannot give you the unique support and placement that your feet need to maintain proper, stable positioning. They are made for the masses. Foot Levelers’ SPS Orthotics are made just for you. 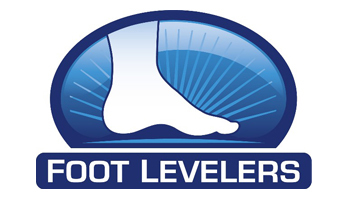 Foot Levelers uses an exact impression of your feet while standing, bearing your body’s full weight. Dr. Levy takes these impressions at his office with the digital patented Associate™ postural analysis system. The impressions are then sent to our laboratory (The Associate™ transmits these via the Internet) where the orthotics are custom made to correct any imbalances found in the three arches of each foot. Your new orthotics are sent to Dr. Levy , who shows you how to wear and care for them. Foot Levelers’ expert technicians analyze every individual foot impression we receive. Using 16 precise measurements, we create a custom SPS Orthotic that restores stability to your feet’s intricate architecture. Only Foot Levelers’ orthotics provide support to all three arches of the foot. Your lifestyle, age, weight, activity level, and condition are all considered when we create your custom orthotics. As your activity changes, so does your shoe style. And different shoe styles require different orthotics. That’s why Foot Levelers’ Combos were created. Combos provide two pairs of orthotics — one for shoes with laces and one for shoes without laces. This way, your body gets the continuous support it needs for work, play and exercise. Foot Levelers offers an amazingly wide variety of stabilizers for men’s, women’s, and children’s shoes, as well as styles for dedicated walkers, runners, golfers, skaters — and many others; as well as two lines of custom-made footwear — Sandalthotics, a custom-made, quality casual sandal; and Shoethotics, a rugged, high-performance athletic shoe customized to fit Foot Levelers’ specifications.